How Can the Workplace Impact Innovation? Gensler’s U.S. Workplace Survey 2016 is the latest in a series that builds on over a decade of workplace research. We started our journey in 2005 by uncovering a link between a better designed work environment and performance. In every subsequent survey, we have tried to peel back the layers of comprehension—to understand why, and how, workplace makes an impact. Through the years, we have uncovered how people work, and we’ve found that effective workplace design links to higher business performance. In our 2013 survey, we discovered that choice drives performance and innovation. That finding really intrigued us and led to this year’s research question—how can the physical workplace environment impact innovation? Our clients are continuously challenged to improve their performance to remain competitive and succeed. In the knowledge economy, innovation and employee engagement can be the difference between leading or following behind the competition. As designers, we know that recognizing what people value most in our workplace design allows us to create higher-performance work environments that are more effective for individuals, teams and entire organizations. This is the secret sauce! In terms of reaching this goal, our research findings this year are amazing. 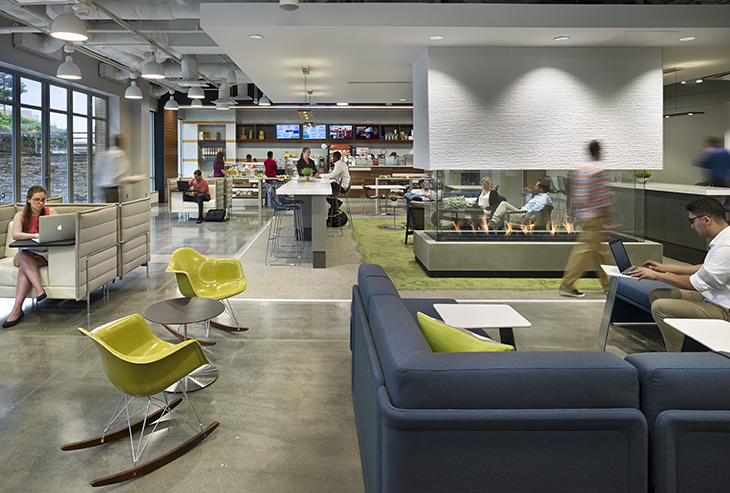 We found undeniable proof that great workplace design drives creativity and innovation. And we didn’t just uncover correlations—we can show direct connections to what is driving innovation. The nature of work itself has been changing over the first two decades of the 21st century. To keep pace with the demands of a new economic landscape, we’ve found that the knowledge workforce continues to adjust by reaching for greater levels of connection, becoming more technologically savvy and more globally oriented than ever before. Based on our ongoing work for clients around the world, we were already aware that virtual collaboration has been increasing, but in our 2016 Workplace Survey, we’ve found that virtual collaboration has more than doubled over the past three years, rising from 7 percent of a typical workweek in 2013 to a full 15 percent in 2016. The composition of the workforce has also been changing, with Millennials surpassing Gen Xers as the generation making up the largest percentage of the U.S. workforce in 2015. We can expect that technological change, urbanization and continuing global economic integration will cause further disruptions to the ways that we live, work and play by the time Millennials become an outright majority of the U.S. workforce in 2020. We can also be sure that by that time, most organizations will have shifted focus to respond to at least one new unknown challenge to their business model or underlying competitive success, creating new strategic demands that will require new sophisticated solutions. Interestingly, our research indicates that adjusting to the workplace preferences of Millennials should not factor among the top list of challenges that organizations will need to respond to in the future, because we have found no statistical generational differences in terms of physical workplace design preferences. We surveyed more than 4,000 knowledge workers in 11 industries across the United States. Workplace Survey respondents were regionally and demographically diverse, and our results are inclusive of all four of the largest generations currently in the U.S. workforce (the Silent Generation, Baby Boomers, Generation Xers and Millennials). We also conducted Workplace Surveys in the U.K., Asia and Latin America this year—those survey results will be shared late summer/early fall and we plan to analyze for a global comparison as well. For the Gensler’s U.S. Workplace Survey 2016, we ran a quartile analysis comparing the top 25 percent of innovation scores to the bottom 25 percent of innovation scores. We found stark differences between the most innovative and least innovative groups. We found differences in their behavior—in how they work, what they do, and the amount of time they spend at their desk, and even a difference in the amount of time they spend away from the office. There were also differences in the types of work spaces they have and use. Innovators not only have more effective workspaces, and better designed spaces, but they also have twice as much access to certain amenities, and have more choice, meaning and purpose. We were also able to identify key drivers that make the biggest impacts to innovation scores and help create what we are calling the “innovation ecosystem.” Designing with these key drivers in mind will help our design teams design better workspaces for our clients to drive innovation. In the U.S. Workplace Survey, we found that innovation results did not vary significantly across different geographies, generations or client industries, but there were surprising differences among job roles. The professional/technical group—including specialists in fields like writing, programming, engineering and research—had the lowest innovation scores out any job category. This means that while administrative workers, managers and executives all saw gains in the effectiveness and performance of their workplace, the group that does the most to propel new innovation forward continues to make do with an under-performing work environment. With a full two-thirds of U.S. workers—roughly 48 million people—working in a workplace environment that is not meeting their needs, this year’s workplace survey makes it clear that there is a sizeable innovation gap holding back a large majority of people from fully thriving in today’s economy. Why does this innovation gap even matter? Because it means that many organizations are running the risk of losing their competitive footing in an evolving economy. As designers, we can help our clients by designing the most effective workspaces specifically geared to foster creativity and support innovation, allowing the physical work environment to be another key tool our clients can use to compete. Closing this gap in workplace performance can fuel billions of dollars in added growth for some of the top companies in the U.S., while also allowing some of the companies or organizations that are currently struggling to make up lost ground in their markets. The findings from our research suggest that great workplace design does indeed drive creativity and innovation. Gensler will be sharing the detailed research findings with our clients in office events this September. Look for a hold-the-date invite coming soon!